Nicotine biotransformation affects the smoking habits of addicted individuals and therefore their health risk. Using an improved analytical method, we have discovered that the human UDP-glucuronosyltransferase (UGT) 2B10, a liver enzyme previously unknown to conjugate nicotine or exhibit considerable activity toward any compound, plays a major role in nicotine inactivation by direct conjugation with glucuronic acid at the aromatic nitrogen atom. The Km value of recombinant UGT2B10 for nicotine (0.29 mM) was similar to that determined for human liver microsomes (0.33 mM), whereas the Km value of UGT1A4 for nicotine was almost 10-fold greater (2.4 mM). UGT2B10 was also more active than UGT1A4 in N-glucuronidation of cotinine (oxidative nicotine metabolite), whereas UGT2B7 exhibited only low nicotine glucuronidation activity and was essentially inactive toward cotinine. UGT1A9 did not glucuronidate nicotine or cotinine. Quantitative reverse transcription-polymerase chain reaction showed that UGT2B10 mRNA was exclusively expressed in human liver, whereas UGTs 1A4 and 2B7 were expressed at comparable, although somewhat lower, levels in liver and several other extrahepatic tissues, including kidney and intestine. These findings for UGT2B10 (but not for UGT1A4 and UGT2B7) were mirrored by human tissue activities because nicotine and cotinine glucuronidation rates in intestine microsomes were less than 0.1% that of human liver microsomes. These novel findings solve two seemingly separate questions: which UGT is primarily responsible for nicotine glucuronidation in human liver, and what conjugation reactions are catalyzed by UGT2B10. Nicotine is not carcinogenic by itself and might even have some beneficial therapeutic effects in some neurological diseases. Nonetheless, it is the major perpetrator of tobacco-related diseases because nicotine addiction drives smokers to pursue the habit despite the known health hazards. Nicotine concentration in the blood increases sharply during cigarette smoking and then decreases rapidly because of metabolism and clearance, driving the addicted individual to reach for another cigarette. Hence, better understanding of nicotine metabolism can assist the development of treatments to reduce the health risks associated with nicotine addiction. Cytochrome P450 monooxygenase 2A6 (CYP2A6) catalyzes nicotine oxygenation and plays an important role in nicotine metabolism (Hukkanen et al., 2005; Nakajima and Yokoi, 2005). However, there is more to nicotine metabolism than CYP2A6 because both nicotine and its primary oxidation metabolite, cotinine, undergo direct N-glucuronidation at the aromatic nitrogen (Fig. 1) (Ghosheh et al., 2001; Ghosheh and Hawes, 2002b). Glucuronidation is catalyzed by one or more of the human liver UDP-glucuronosyltransferases (UGTs) (Radominska-Pandya et al., 1999; Tukey and Strassburg, 2000; Wells et al., 2004). The UGTs are membrane-bound enzymes of the endoplasmic reticulum that catalyze glucuronic acid transfer from UDP-glucuronic acid (UDPGA) to a large variety of aglycones, both endogenous compounds and xenobiotics. There are some 19 human UGTs that are divided into two families, UGT1 (or UGT1A) and UGT2, based on sequence homology and gene structure (Mackenzie et al., 2005). The expression of UGTs is tissue-specific. However, most UGTs are expressed in more than one tissue, and nearly each human tissue that contains UGTs carries more than a single UGT isoform (Tukey and Strassburg, 2000; Mackenzie et al., 2003). Nonetheless, the liver is the major site of glucuronidation in our body, and most UGTs, but not all, are expressed in liver cells. The substrate-specificity of the human UGTs is highly complex. Most human UGTs can glucuronidate several different compounds with variable chemical structure, albeit at different kinetics (Uchaipichat et al., 2004). This leads to partial overlap in the substrate-specificity of individual UGTs. However, alongside individual human UGTs that are well-documented to metabolize many different aglycones with high activity, there are also a few UGTs that so far have demonstrated either no activity or only very limited activity when screened against a large variety of aglycone substrates. These so-called “orphan”, or nearly orphan, UGTs include UGT2B10, UGT2B11 (Turgeon et al., 2003), UGT1A5 (Finel et al., 2005), and perhaps UGT2B28 (Lévesque et al., 2001). The UGTs mostly catalyze the conjugation of a hydroxyl group in the aglycone substrate with glucuronic acid from the cosubstrate UDPGA. However, some UGTs can also conjugate other functional groups such as different amines (Green and Tephly, 1998; Hawes, 1998; Zenser et al., 2002; Borlak et al., 2006). 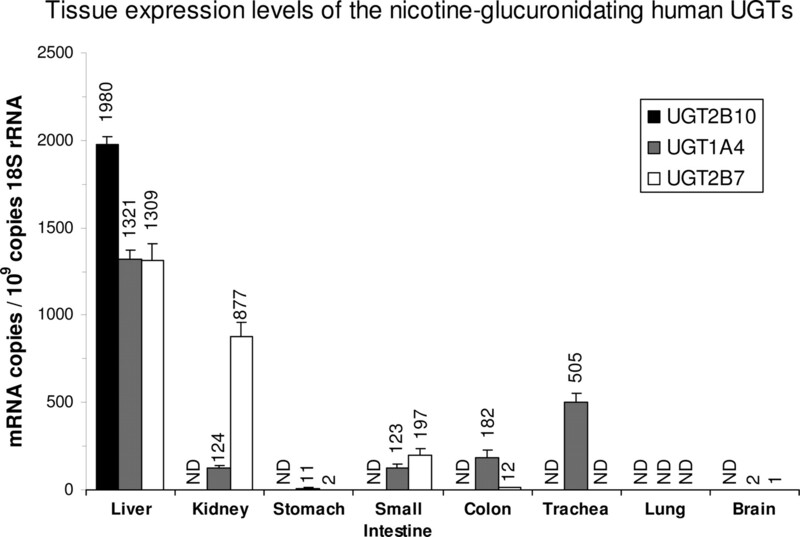 Nicotine is one of several xenobiotics that are subjected to direct N-glucuronidation when incubated with human liver microsomes in the presence of UDPGA (Ghosheh et al., 2001). Which enzyme catalyzes nicotine glucuronidation? Several laboratories have tried to identify the main nicotine glucuronidating human UGT, but this undertaking turned out to be highly challenging (Ghosheh and Hawes, 2002b; Nakajima et al., 2002; Kuehl and Murphy, 2003). Among the tested human UGTs, UGT1A4, an enzyme “specializing” in N-glucuronidation, was the most efficient in cotinine glucuronidation (Kuehl and Murphy, 2003; Nakajima and Yokoi, 2005). However, it was also concluded that the contribution of UGT1A4 to nicotine glucuronidation may be minor, and another not-yet-identified UGT may play a significant role in nicotine metabolism (Ghosheh and Hawes, 2002b; Kuehl and Murphy, 2003; Nakajima and Yokoi, 2005). Armed with an improved analytical method and prompted by several incidental observations about the little-studied UGT2B10 (Girard et al., 2005), we set out to solve this enduring question regarding nicotine metabolism. Chemical structures of nicotine, cotinine, and their respective N-glucuronides. Materials. (–)-Nicotine hydrogen tartrate salt, (–)-cotinine, alamethicin (from Trichoderma viride), and d-saccharic acid 1,4-lactone were purchased from Sigma-Aldrich (St. Louis, MO). UDPGA (as triammonium salt) was from Fluka Chemie (Buchs, Switzerland). Nicotine-N-β-glucuronide hydrate, nicotine-N-β-glucuronide(-methyl-d3), cotinine-N-β-d-glucuronide, and (R,S)-cotinine-N-β-d-glucuronide(-methyl-d3) were purchased from Toronto Research Chemicals (Toronto, ON, Canada). Pooled human liver microsomes (HLM; 18 donors) and pooled human intestine microsomes (HIM) were from BD Biosciences (Bedford, MA). According to the manufacturer, the intestine microsomes were prepared from both the duodenum and jejunum sections of five different donors and so that they could be regarded as small intestine microsomes. As a positive control for the UGTs in the two different human microsomes samples, they were subject to activity assays in the presence of 100 μM. The entacapone glucuronidation activity in HIM was high (27% of substrate was converted to entacapone glucuronide using 0.3 mg/ml microsomal protein activated with alamethicin, and 1-h incubation time), and it was 29% of the glucuronidation activity measured in HLM under the same incubation conditions. Recombinant human UGTs were produced in baculovirus-infected insect cells as described previously (Kurkela et al., 2003, 2007). The relative expression levels of UGT1A4, UGT1A9, UGT2B7, and UGT2B10 in the test samples were determined simultaneously by immunodetection using a tetra-His monoclonal antibody (QIAGEN, Hilden, Germany) as detailed elsewhere (Kurkela et al., 2007). UGT mRNA Expression in Human Tissues. Total RNA was extracted using TRIzol reagent (Sigma-Aldrich) from 47 human livers and pooled. Liver donors were all of European-American ancestry and included both male (n = 36) and female (n = 11) subjects. Use of the tissue was approved by the institutional review board of Tufts University School of Medicine (Boston, MA). Total RNA from human kidney (male African-American donor), small intestine (five European-American donors), colon (three European-American donors), trachea (male European-American donor), lung (male African-American donor), and whole brain (male African-American donor) were purchased from Clontech (Mountain View, CA), whereas total RNA from human stomach (male European-American donor) was from Ambion (Austin, TX). To generate cDNA, 1 μg of total RNA was treated with DNase enzyme (Promega, Madison, WI) and then reverse-transcribed (SuperScript II; Invitrogen, Carlsbad, CA) with random hexamer primer (0.1 μg) according to the manufacturers' protocol. Quantitative PCR reactions (25 μl) included Sybr Green 2X master mix (Applied Biosystems, Foster City, CA), 10 μl of 1:10 diluted cDNA (except 1:30 dilution for liver cDNA and 1:500 to 1:1500 dilution for cDNA assayed with 18S rRNA primers), and 200 nM concentration of each primer. Primer pair sequences were as follows: CCC CTC GAT GCT CTT AGC TGA GTG T (18S-rRNA, forward), CGC CGG TCC AAG AAT TTC ACC TCT (18S-rRNA, reverse), TGC GCC ACA AAG GAG CCA AAC AT (UGT2B10, forward), ATG ATA AAT AGC ACG GTT GCC ACA CAA (UGT2B10, reverse), GTT ACG CTG GGC TAC ACT CAA GG (UGT1A4, forward), CTC CAC ACA ACA CCT ATG AAG GG (UGT1A4, reverse), TTT CAC AAG TAC AGG AAA TCA TGT CAA T (UGT2B7, forward), and CAG CAG CTC ACT ACA GGG AAA AAT (UGT2B7, reverse). Real-time PCR analysis (model 7300; Applied Biosystems) was performed with the following PCR method: 95°C for 10 min, 40 to 45 cycles of 95°C for 30 s, and 60°C for 60 s. Amplification specificity was ensured initially by sequencing of representative PCR products, and in each run by PCR product duplex melting-temperature analysis. Negative controls included the exclusion of cDNA template and reverse-transcription enzyme. mRNA concentrations were calculated using standard curves of PCR threshold cycle number versus concentration of template, which were derived from serial dilutions of purified PCR product. Curves were found to be linear (R2 > 0.99) over the concentration range 10–9 to 10–14 M for 18S rRNA and 10–14 to 10–18 M for other gene products, which defined the upper and lower quantitation limits of the respective assays. For each tissue, cDNA reactions were performed in triplicate, and quantitative PCR reactions were performed at least in duplicate. Results were expressed as the mean (S.E.) number of mRNA copies per 109 copies of 18S rRNA. Assay precision as reflected by the coefficient of variation of replicates averaged 19, 18, and 23% for UGT1A4, UGT2B7, and UGT2B10, respectively. Activity Assays. The incubation mixtures contained 100 mM phosphate buffer, pH 7.4, 5 mM MgCl2, 0.2 to 1 mg protein/ml recombinant UGTs, HLM, or HIM, 5 mM UDPGA, and 0.1, 0.5, or 4 mM nicotine or cotinine. Alamethicin (100 μg/mg microsomal protein) was added to HLM and HIM incubations but not to incubations with recombinant UGTs. The kinetic assays were performed typically at 10 concentrations of nicotine or cotinine (0.005–4 mM). Under the assay conditions, metabolite formation was shown to be linear with respect to both protein concentration (0.2 mg protein/ml for HLM, 1 mg protein/ml for HIM and recombinant UGTs) and incubation time (60–120 min). The reactions were initiated by the addition of UDPGA, incubated at 37°C for 60 to 120 min, and terminated by protein precipitation with trifluoroacetic acid, whereas the incubates were kept in an ice-water bath. After centrifugation, internal standard [methyl-d3-nicotine glucuronide or (R,S)-methyl-d3-cotinine glucuronide] was added, and the samples were subjected to LC-MS analysis. The apparent kinetic parameters Km and Vmax were estimated by nonlinear regression analysis using SigmaPlot Enzyme Kinetics Module v. 1.1 (SPSS Inc., Chicago, IL). The conventional Michaelis-Menten equation was fitted to initial velocity data without weighting factors. The goodness of the fit was evaluated by visual inspection of the Eadie-Hofstee plots, the standard errors of the parameters, and R2 values. LC-MS Analyses. The samples were analyzed using an Agilent series 1100 liquid chromatograph (Agilent, Waldbronn, Germany) with a thermostated column compartment at 30°C using a Discovery HS F5 100 × 2.1-mm C18 column (Sigma-Aldrich) and a 20 × 4.0-mm guard column of the same material. The mobile phase consisted of two solvents, methanol and trifluoroacetic acid in water, pH 2.2, and the flow rate was 0.2 ml/min. The proportion of methanol increased linearly from 5 to 30% during the 15-min gradient run. The glucuronides were monitored by Agilent 1100 series single quadrupole mass spectrometer (model G-1946A) with atmospheric pressure electrospray ionization using the following settings: N2 as drying gas (13.0 l/min, 350°C), nebulizer pressure 50 psi, Vcap(pos) 4 kV, and fragmentor voltage 150 V. Nicotine glucuronide and the internal standard methyl-d3-nicotine glucuronide were monitored as [M + H]+ ions at m/z 339 and 342, respectively, and both eluted at approximately 6.3-min retention time (Fig. 2). Cotinine glucuronide and the internal standard (R,S)-methyl-d3-cotinine glucuronide were monitored as [M+H]+ ions at m/z 353 and 356, respectively. The retention time of cotinine glucuronide was approximately 8.3 min, whereas (R,S)-methyl-d3-cotinine glucuronide eluted in two peaks between 8.5 and 9 min. Because the two peaks of the diastereomeric internal standard were inseparable in the liquid chromatography stage of the analysis, the peak area sum of them was used in the internal standardization. Nicotine and cotinine glucuronides were quantified by comparing peak area ratios (analyte/internal standard) with the peak area ratios generated with a standard curve. We have developed an improved LC-MS method to quantify with high sensitivity and specificity the nicotine and cotinine N-glucuronidation activity of recombinant UGTs. In previous studies, there were clear difficulties in measuring this activity (Ghosheh and Hawes, 2002b; Nakajima et al., 2002), mainly because of a combination of low rates of nicotine glucuronidation by recombinant UGTs and insensitive analytical methods. Using a pentafluorophenylpropyl-bonded column and a trifluoroacetic acid-methanol gradient, we obtained good column retention, even for the highly hydrophilic nicotine and cotinine glucuronides (Fig. 2), compounds that otherwise have very poor retention by conventional C18 columns. In addition to chromatographic improvements, we took advantage of the relatively high sensitivity of mass spectrometry detection and incorporated commercially available glucuronide standards and deuterated internal standards to enhance accuracy. Using this newly developed method, we were able to quantify as little as 5 nM (corresponding to UGT activity of 0.04 pmol/min/mg) of nicotine glucuronide formed in the samples and 10 nM (0.08 pmol/min/mg) of cotinine glucuronide. Our newly developed analytical method was applied to the determination of nicotine and cotinine glucuronidation rates by UGT1A4 and UGT1A9, enzymes reported previously to catalyze nicotine glucuronidation (Kuehl and Murphy, 2003), and by UGT2B7, an enzyme that is involved in the glucuronidation of many structurally diverse xenobiotics including N-glucuronidation reactions (Zhang et al., 2004; Xu et al., 2006). It is noteworthy that the activity of UGT2B10 was also determined because our preliminary studies with this enzyme showed efficient N-glucuronidation of certain other compounds (Kaivosaari S, Koskinen M, and Finel M, manuscript in preparation). In the course of these experiments, it was noticed that the activity of recombinant UGT2B10 sharply declines upon the isolation of microsomal membranes from insect cells (Fig. 3). We have thus skipped the step of microsomal membrane isolation and thereafter switched to the use of cell homogenates in activity determinations for the recombinant UGT2B10. In addition, the assays of UGT1A9 and UGT2B7 that are reported here were performed using cell homogenates. 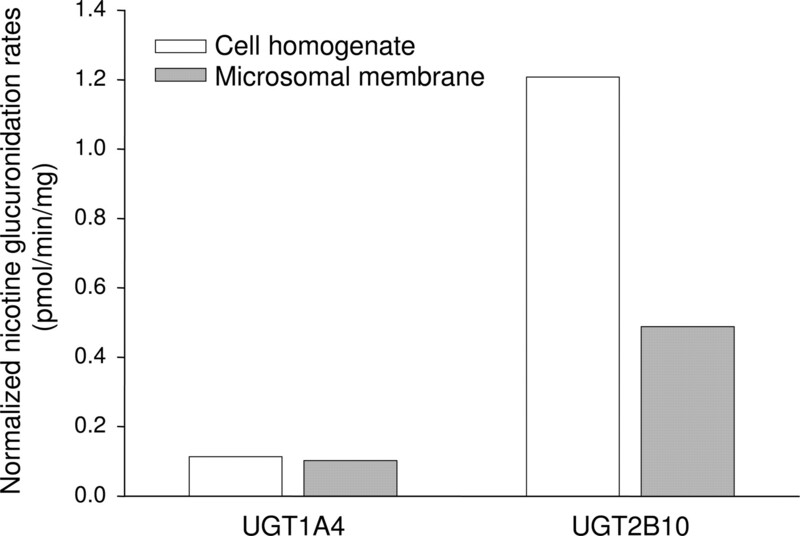 In the case of UGT1A4, however, the measurements were performed using microsomal membranes because the normalized activity in both preparations was very similar (Fig. 3), and previous studies on nicotine glucuronidation used equivalent preparations (Kuehl and Murphy, 2003). Detection of nicotine and cotinine glucuronidation by LC-MS. 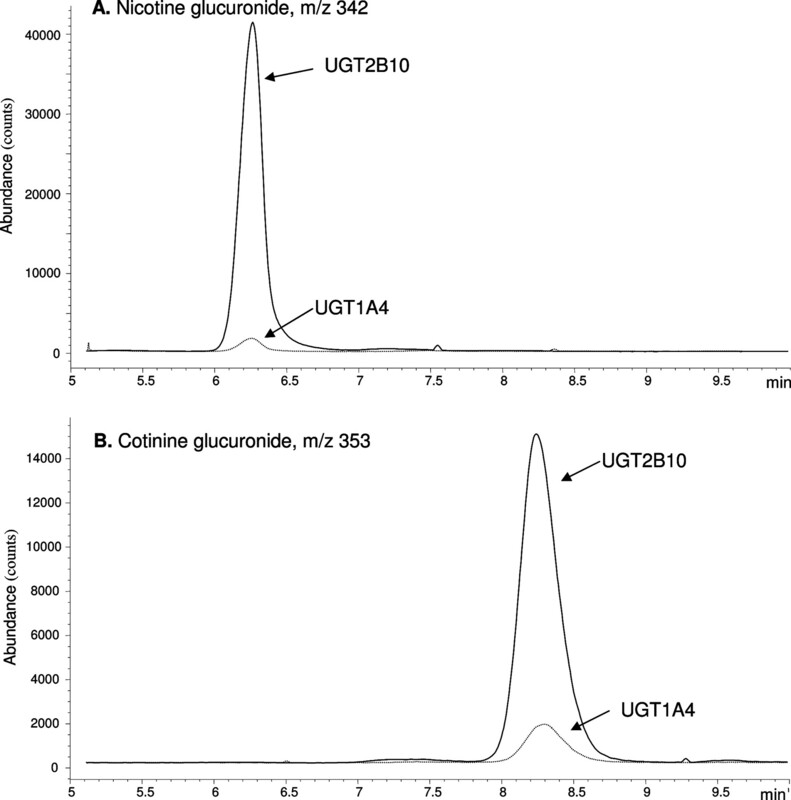 The chromatograms demonstrate the detection of glucuronides produced by incubations of 1 mg protein/ml recombinant UGT1A4 (microsomal membrane) or UGT2B10 (cell homogenate) in the presence of 0.5 mM concentration of either nicotine (A) or cotinine (B) by the analytical methods described in this work (see Materials and Methods for details). The relative expression level of each of these recombinant UGTs was measured by immunodetection (see Materials and Methods) to allow better comparison of their glucuronidation activity by adjusting them to the relative amount of enzyme in each sample (i.e., normalization of expression level). The relative expression levels per milligram of protein in the sample (either cell homogenate or microsomal membranes) ranged from 1.0 for UGT1A4 through 1.8 and 2.1 for UGT2B10 and UGT2B7, respectively, and up to 4.5 for UGT1A9. The results of the nicotine and cotinine glucuronidation analyses are presented in Fig. 2. Three different substrate concentrations, 0.1, 0.5, and 4 mM, were used in these activity assays, and the major result of these experiments was that the human UGT2B10 is the most active human UGT in both nicotine and cotinine glucuronidation, at least as far as normalized activity is concerned (Fig. 4, A and B). In line with the previous report (Kuehl and Murphy, 2003), UGT1A4 exhibited detectable N-glucuronidation of both nicotine and cotinine but only at the two higher substrate concentrations (Fig. 4A). The analyses of UGT1A9 did not reveal any nicotine or cotinine glucuronidation activity, but we have detected a low level of nicotine glucuronidation by UGT2B7 (Fig. 4A). The cotinine glucuronidation activity of UGT1A4 was similar to its activity toward nicotine, whereas cotinine glucuronidation by UGT2B10 at lower substrate concentrations was significantly lower than its rate of nicotine glucuronidation (Fig. 2B), suggesting lower affinity of this enzyme for cotinine (see below). 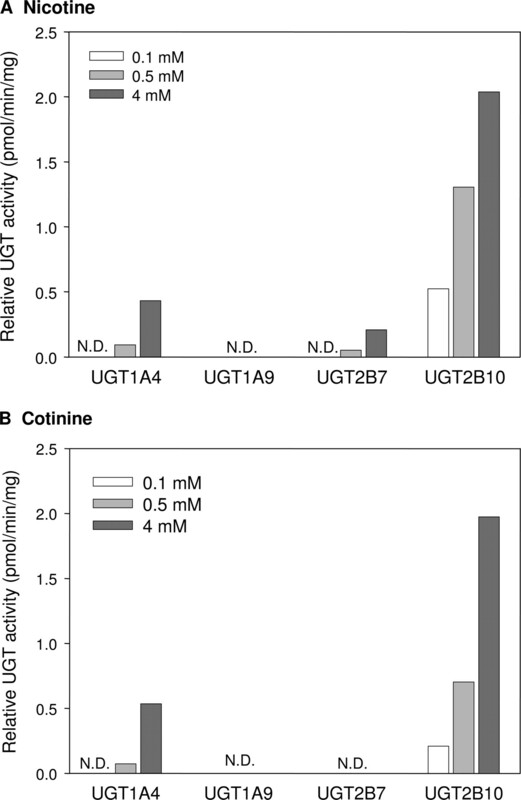 Cotinine glucuronidation by UGT2B7 was lower than the quantification limit. Influence of microsomal membrane preparation on the normalized activity of recombinant UGT2B10. The glucuronidation rate of nicotine, 0.5 mM, by recombinant UGTs 1A4 and 2B10 was assayed using either microsomal membranes from the insect SF9 cells that were used to produced these enzymes or in cell homogenates. The activities were determined in duplicate (<10% difference), and the results were normalized according to the relative amount of immunodetectable UGT in each sample (see Materials and Methods for further details). Kinetic analyses were performed for nicotine and cotinine glucuronidation by recombinant UGTs 1A4 and 2B10 and by HLMs. Large differences were observed between recombinant UGTs and HLM in glucuronidation rates of both nicotine and cotinine (Fig. 5). This difference is possibly due to a lower concentration of fully active enzyme in SF9 cell membranes, resulting from a limited capacity of insect cells to support correct folding and/or post-translational modification of heterologously expressed UGTs. The Km values, however, are independent of the enzyme concentration and provide a useful tool to compare recombinant UGTs with the native enzymes in HLM. 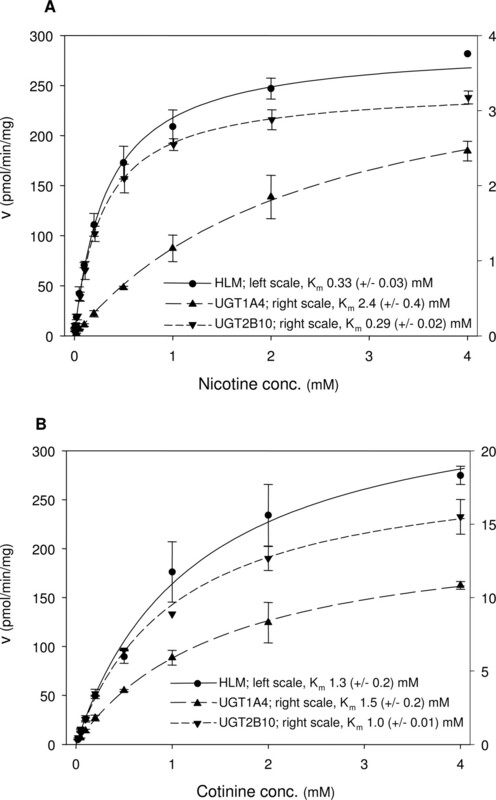 These kinetic analyses revealed a marked difference in the affinities of UGT1A4 and HLM for nicotine, whereas the Km value of UGT2B10 for nicotine was very similar to the corresponding value of HLM (Fig. 5A). In the case of cotinine glucuronidation, the Km values of UGT1A4, UGT2B10, and HLM were quite similar to each other (Fig. 5B). Despite this, the expression-normalized cotinine glucuronidation activity of recombinant UGT2B10 was significantly higher than that of UGT1A4 (Fig. 4B). 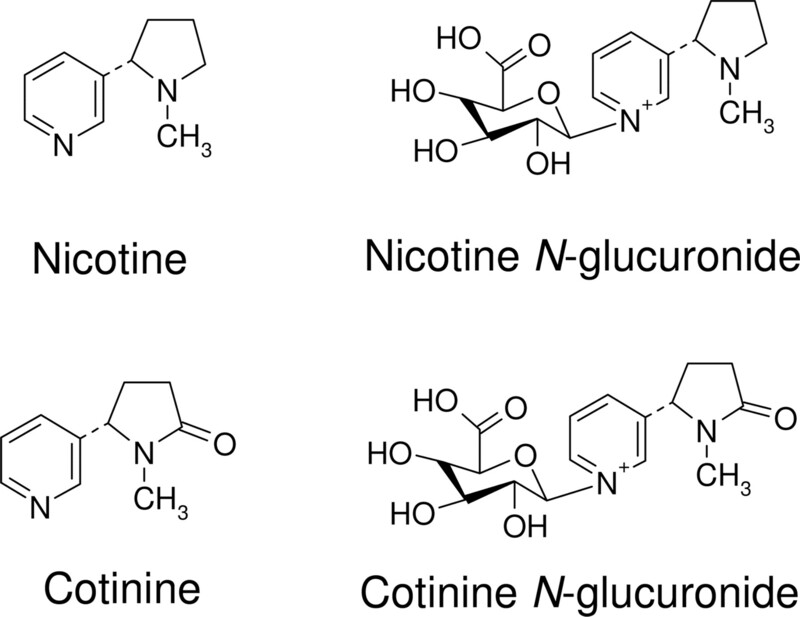 Glucuronidation activity of recombinant human UGTs 1A4, 1A9, 2B7, and 2B10 toward nicotine (A) and cotinine (B). Three different substrate concentrations were used in each case, and the activity rates were normalized to the relative expression level of each recombinant UGT (see Materials and Methods for further details). Activities were determined in duplicate (<10% difference). N.D., no detectable activity or activity below quantification limit (0.04 and 0.08 pmol/min/mg for nicotine and cotinine, respectively). Expression levels of UGT2B10, UGT1A4, and UGT2B7 in selected tissues were determined using a highly sensitive and qRT-PCR method (Fig. 6). The results were particularly interesting with respect to UGT2B10 because, at least at the level of mRNA, this gene was exclusively expressed in human liver (see also Strassburg et al., 2000; Nishimura and Naito, 2006) and at levels similar to UGT1A4 and UGT2B7. UGTs 1A4 and 2B7, on the other hand, were also expressed at significant levels in several of the other tested tissues, including kidney, small intestine, colon, and trachea (Fig. 6). Of particular note is that both UGT1A4 and UGT2B7 were expressed in the small intestine at approximately 10% of the level of that in the liver, whereas UGT2B10 was not detected (i.e., less than 1 copy of UGT2B10 mRNA per 109 copies of 18S rRNA, or less than 0.05% of the liver level). This latter finding provided us with a unique, although indirect, method to demonstrate that the native UGT2B10 (not merely the recombinant enzyme) is the main human UGT responsible for nicotine glucuronidation through comparison of nicotine glucuronidation activities in human liver and intestine microsomes, as follows. Kinetic analyses of the glucuronidation of nicotine (A) and cotinine (B) by HLMs and recombinant human UGT1A4 and UGT2B10. The glucuronidation rates, v, for the HLMs are presented on the left-hand side of the y-axis, whereas the right-hand side values are for the nonnormalized rates of the recombinant UGT samples. The rates represent the mean (±S.D.) of two to four independent determinations. The calculated Km (±S.E.) values for the substrate, derived from the Michaelis-Menten equation, are also presented (see Materials and Methods for further technical details). 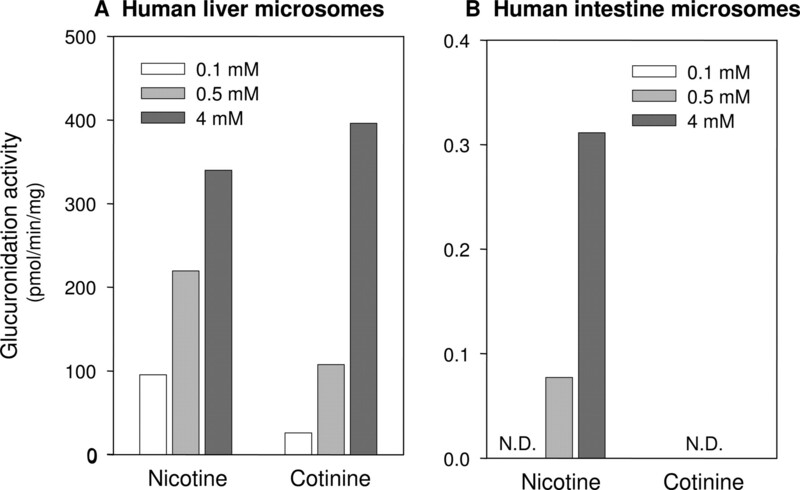 Nicotine and cotinine glucuronidation rates were determined in pooled samples of human microsomes from either the liver (HLM, 18 donors) or the small intestine (HIM, 5 donors). The results revealed very low but quantifiable nicotine glucuronidation activity in HIM (Fig. 5B), something that was not reported previously (Ghosheh and Hawes, 2002a), probably because of the lower sensitivity of the methods used earlier. Nevertheless, the nicotine glucuronidation activity in the small intestine was only approximately 0.1% that of the nicotine activity in the liver (Fig. 7A, note the different scale on the y axes), a result that mirrored the tissue differences in UGT2B10 mRNA levels but not UGT1A4 or 2B7 mRNA levels (see above). Cotinine glucuronidation by HIM was lower than the limit of quantification, whereas in HLM, it was at the same range as the nicotine glucuronidation rate (Fig. 7, A and B). In agreement with the kinetic analyses (Fig. 5), the dependence of cotinine glucuronidation rate by HLM on substrate concentration was different from the nicotine glucuronidation rate of these microsomes (Fig. 7A). Taken together, these results strongly suggest that UGT2B10 is the major UGT isoform mediating nicotine N-glucuronidation in human liver. Nicotine is the major culprit in tobacco-related diseases, causing smokers to pursue their habit despite the known health hazards. Understanding nicotine biotransformation in our body is therefore both interesting and important. Determining which of the human UGTs is primarily responsible for N-glucuronidation of nicotine has been a highly challenging objective in the past (Ghosheh and Hawes, 2002b; Nakajima et al., 2002; Kuehl and Murphy, 2003), much more than is regularly encountered when glucuronidation is studied. Clarifying this issue, therefore, is expected to contribute significantly to our understanding of the substrate-specificity of UGTs, particularly with respect to such N-glucuronidation reactions. The improved analytical method to study nicotine glucuronidation contributed significantly to the new finding. Nonetheless, a major clue came from preliminary studies that showed recombinant human UGT2B10 can catalyze more efficient N-glucuronidation of some substrates that are only poorly glucuronidated by recombinant UGT1A4 (S. Kaivosaari, M. Koskinen, and M. Finel, unpublished observation). We have also noticed that the activity of recombinant UGT2B10 is sensitive to the regular procedure for the isolation of microsomes from the baculovirus-infected insect cells, a finding that may partly explain why the glucuronidation activity of this enzyme was barely detected in past works (Turgeon et al., 2003; Girard et al., 2005). As a result, until now, UGT2B10 was largely assumed to be an “orphan” enzyme. The finding reported here may prompt other investigators to rethink and re-examine the involvement of UGT2B10 in the metabolism and clearance of a number of xenobiotics, particularly those undergoing N-glucuronidation. It may be premature to speculate at this point as to the reasons leading to the higher activity of UGT2B10 in whole-cell homogenates versus microsomal membrane preparations (Fig. 3). Experiments with different recombinant UGTs production systems must be carried out before one can conclude with confidence whether or not this is only a characteristic of UGT2B10 expressed in baculovirus-infected insect cells. Nevertheless, we suggest that regardless the source of recombinant UGTs, future studies on the glucuronidation of different compounds will include cell homogenates, alongside isolated microsomes, at least at the screening stages. UGT2B10 is not the only human enzyme capable of nicotine glucuronidation, and until this work, it was assumed that UGT1A4 is responsible for most of this activity in human liver microsomes (Kuehl and Murphy, 2003; Nakajima and Yokoi, 2005). In addition, UGT1A9 was reported to exhibit such activity (Kuehl and Murphy, 2003). Although our results question the role of UGT1A9 in N-glucuronidation of nicotine, they clearly confirm the activity of UGT1A4 and also demonstrate low but detectable nicotine glucuronidation activity by UGT2B7 (Fig. 4A). Nonetheless, the present findings strongly suggest that UGT2B10, rather than either UGT1A4 or UGT2B7, plays the major role in nicotine glucuronidation. mRNA expression levels of the identified nicotine-glucuronidating enzymes in human tissues. Total RNA was extracted from human liver (47 donors pooled), kidney, stomach, small intestine (5 donors pooled), colon (3 donors pooled), trachea, lung, and whole brain. Quantitative reverse transcription-PCR was then performed using primers specific for UGT2B10, UGT1A4, UGT2B7, and 18S rRNA (for normalization) and quantified by the use of standard curves. Bars represents the mean (S.E.) of three independent reverse-transcription reactions performed for each tissue. N.D., no detectable mRNA. Activity analyses of human microsomes from either the liver (A) or intestine (B; the microsomes were from the duodenum and jejunum sections of the intestine) in N-glucuronidation of nicotine and cotinine. Three different substrate concentrations were used in the assays. Note the differences in y-axis units between A and B. Activities were determined in duplicate (<10% difference). N.D., no detectable activity or activity below quantification limit (0.04 and 0.08 pmol/min/mg for nicotine and cotinine, respectively). Evidence that UGT2B10 is responsible for hepatic N-glucuronidation of nicotine and is a major contributor to cotinine glucuronidation is derived from two major lines of experimentation. In the case of recombinant UGTs, the activity assays clearly demonstrate that the normalized activity of UGT2B10 is much higher than that of UGT1A4 or UGT2B7 for both nicotine and cotinine glucuronidation (Fig. 4). Moreover, the Km value of UGT2B10 for nicotine was similar to the corresponding Km value in HLM, whereas in UGT1A4, this value was much higher (Fig. 5). In addition, the qRT-PCR results, although not a direct measure for the content of the different UGTs in HLM, suggest that the amount of UGT2B10 in the liver is considerable and is in the same range as UGT1A4 and UGT2B7, if not higher (Fig. 6). In the case of native enzymes expressed in human tissues, our results support previous finding that the major site of nicotine glucuronidation in the human body is the liver (Ghosheh and Hawes, 2002a). In combination with the qRT-PCR results (Fig. 6), the very low nicotine glucuronidation found in HIM (Fig. 7) suggests that neither UGT1A4 nor UGT2B7 plays a major role in hepatic nicotine glucuronidation. On the other hand, the correlation between the tissue nicotine glucuronidation activity (Fig. 7) and the expression level of UGT2B10 (Fig. 6) is striking. This is very strong circumstantial evidence that native UGT2B10 is indeed responsible for hepatic nicotine glucuronidation, which is in full agreement with the results from recombinant UGTs (Figs. 4 and 5). Sequence alignment of N-terminal 51 to 60 amino acids of all the human UGTs. The highly but not strictly conserved histidine residue, His39 in the case of UGT1A1, is indicated by boldface type and italics. The starting point of the mature UGTs sequence and the signal sequences that precede it are also indicated. 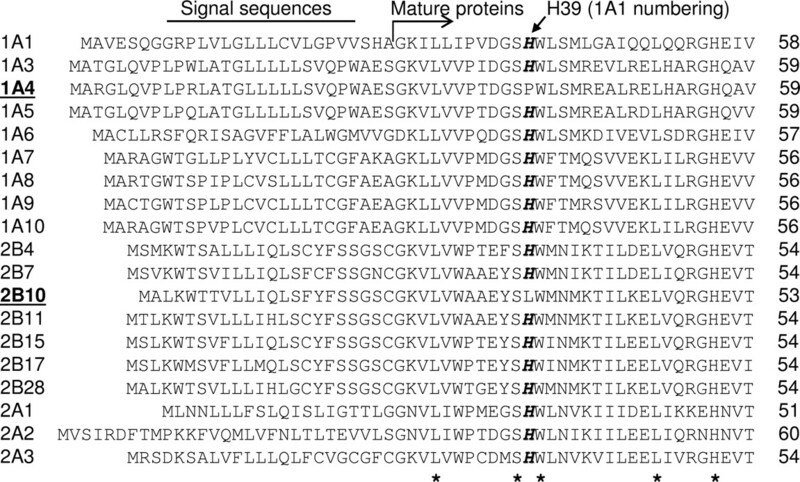 Asterisks at the bottom indicate residues that are fully conserved among the human UGTs (Mackenzie et al., 2005) for the source of the sequences (including UGT2A2). Knowing now that UGT2B10 is specifically active in the N-glucuronidation of certain compounds raises the question of what makes UGT2B10 and UGT1A4 rather specialized in this type of conjugation reaction. This contrasts with several other enzymes, such as UGT1A3 and UGT2B7, that can catalyze the N-glucuronidation of certain aglycones in addition to other glucuronidation reactions (Green and Tephly, 1998; Zenser et al., 2002; Zhang et al., 2004; Borlak et al., 2006; Xu et al., 2006). This difference in function could be reflected by the primary structure of these enzymes, and an inspection of the amino acid sequences of all the human UGTs has indeed revealed an interesting observation. Specifically, the histidine residue near the N terminus of the mature UGTs, His39 (UGT1A1 numbering; Fig. 8) is highly but not totally conserved in the human UGTs (and in many related proteins), and it was shown recently to be involved in the catalytic activity of UGT2B7 (Miley et al., 2007). The only two sequences in which this histidine is replaced by another residue are UGT1A4 and UGT2B10 (Fig. 8). On the other hand, the replacements are quite different, a proline in the case of UGT1A4, whereas in UGT2B10 it is a leucine, suggesting that the full explanation for the N-glucuronidation preference is probably more complex. In any case, because these deviations from the conserved histidine residue occur within a conserved albeit short stretch of protein (Fig. 8), they may be significant for the preference of these UGTs for N-glucuronidation of suitable aglycones. In conclusion, this work describes a set of observations and findings that solve the lingering question of which one of the human UGTs is mainly responsible for the N-glucuronidation of nicotine, revealing for the first time that UGT2B10 is an important hepatic UGT with several xenobiotic substrates (nicotine and cotinine) rather than being an orphan enzyme. This work also demonstrates that the UGT2B subfamily of the human UGTs contains a member that specializes in N-glucuronidation reactions. These results open new research avenues, toward both a better understanding and possible manipulation of nicotine metabolism and a deeper understanding of structure-function relationships among the UGTs. We thank Johanna Mosorin, Marja Härmä, and Qin Hao for skillful technical assistance. This research was supported by the Academy of Finland (projects 207535 and 210933) and the Sigrid Juselius Foundation. M.H.C. is supported by grants GM61834 and GM74369 from the National Institute of General Medical Sciences, National Institutes of Health, Bethesda, Maryland. L.M.H. is the recipient of a Ruth Kirschstein postdoctoral fellowship training award (F32-AA15647) from the National Institute on Alcohol Abuse and Alcoholism, National Institutes of Health, Bethesda, Maryland. ABBREVIATIONS: UGT, UDP-glucuronosyltransferase; HIM, human intestine microsomes; HLM, human liver microsomes; LC-MS, liquid chromatography-mass spectrometry; UDPGA, UDP-glucuronic acid; qRT-PCR, quantitative reverse transcription-polymerase chain reaction; PCR, polymerase chain reaction. Borlak J, Gasparic A, Locher M, Schupke H, and Hermann R (2006) N-Glucuronidation of the antiepileptic drug retigabine: results from studies with human volunteers, heterologously expressed human UGTs, human liver, kidney, and liver microsomal membranes of Crigler-Najjar type II. Metabolism 55: 711–721. Finel M, Li X, Gardner-Stephen D, Bratton S, Mackenzie PI, and Radominska-Pandya A (2005) Human UDP-glucuronosyltransferase 1A5: identification, expression, and activity. J Pharmacol Exp Ther 315: 1143–1149. Ghosheh O and Hawes EM (2002a) Microsomal N-glucuronidation of nicotine and cotinine: human hepatic interindividual, human intertissue, and interspecies hepatic variation. Drug Metab Dispos 30: 1478–1483. Ghosheh O and Hawes EM (2002b) N-glucuronidation of nicotine and cotinine in human: formation of cotinine glucuronide in liver microsomes and lack of catalysis by 10 examined UDP-glucuronosyltransferases. Drug Metab Dispos 30: 991–996. Ghosheh O, Vashishtha SC, and Hawes EM (2001) Formation of the quaternary ammonium-linked glucuronide of nicotine in human liver microsomes: identification and stereoselectivity in the kinetics. Drug Metab Dispos 29: 1525–1528. Girard H, Thibaudeau J, Court MH, Fortier LC, Villeneuve L, Caron P, Hao Q, von Moltke LL, Greenblatt DJ, and Guillemette C (2005) UGT1A1 polymorphisms are important determinants of dietary carcinogen detoxification in the liver. Hepatology 42: 448–457. Green MD and Tephly TR (1998) Glucuronidation of amine substrates by purified and expressed UDP-glucuronosyltransferase proteins. Drug Metab Dispos 26: 860–867. Hawes EM (1998) N+-glucuronidation, a common pathway in human metabolism of drugs with a tertiary amine group. Drug Metab Dispos 26: 830–837. Hukkanen J, Jacob P 3rd, and Benowitz NL (2005) Metabolism and disposition kinetics of nicotine. Pharmacol Rev 57: 79–115. Kuehl GE and Murphy SE (2003) N-glucuronidation of nicotine and cotinine by human liver microsomes and heterologously expressed UDP-glucuronosyltransferases. Drug Metab Dispos 31: 1361–1368. Kurkela M, Garcia-Horsman JA, Luukkanen L, Morsky S, Taskinen J, Baumann M, Kostiainen R, Hirvonen J, and Finel M (2003) Expression and characterization of recombinant human UDP-glucuronosyltransferases (UGTs). UGT1A9 is more resistant to detergent inhibition than other UGTs and was purified as an active dimeric enzyme. J Biol Chem 278: 3536–3544. Kurkela M, Patana AS, Mackenzie PI, Court MH, Tate CG, Hirvonen J, Goldman A, and Finel M (2007) Interactions with other human UDP-glucuronosyltransferases attenuate the consequences of the Y485D mutation on the activity and substrate affinity of UGT1A6. Pharmacogenet Genomics 17: 115–126. Lévesque E, Turgeon D, Carrier JS, Montminy V, Beaulieu M, and Belanger A (2001) Isolation and characterization of the UGT2B28 cDNA encoding a novel human steroid conjugating UDP-glucuronosyltransferase. Biochemistry 40: 3869–3881. Mackenzie PI, Walter Bock K, Burchell B, Guillemette C, Ikushiro S, Iyanagi T, Miners JO, Owens IS, and Nebert DW (2005) Nomenclature update for the mammalian UDP glycosyltransferase (UGT) gene superfamily. Pharmacogenet Genomics 15: 677–685. Miley MJ, Zielinska AK, Keenan JE, Bratton SM, Radominska-Pandya A, and Redinbo MR (2007) Crystal structure of the cofactor-binding domain of the human phase II drug-metabolism enzyme UDP-glucuronosyltransferase 2B7. J Mol Biol 369: 498–511. Nakajima M, Tanaka E, Kwon JT, and Yokoi T (2002) Characterization of nicotine and cotinine N-glucuronidations in human liver microsomes. Drug Metab Dispos 30: 1484–1490. Nakajima M and Yokoi T (2005) Interindividual variability in nicotine metabolism: C-oxidation and glucuronidation. Drug Metab Pharmacokinet 20: 227–235. Nishimura M and Naito S (2006) Tissue-specific mRNA expression profiles of human phase I metabolizing enzymes except for cytochrome P450 and phase II metabolizing enzymes. Drug Metab Pharmacokinet 21: 357–374. Radominska-Pandya A, Czernik PJ, Little JM, Battaglia E, and Mackenzie PI (1999) Structural and functional studies of UDP-glucuronosyltransferases. Drug Metab Rev 31: 817–899. Strassburg CP, Kneip S, Topp J, Obermayer-Straub P, Barut A, Tukey RH, and Manns MP (2000) Polymorphic gene regulation and interindividual variation of UDP-glucuronosyltransferase activity in human small intestine. J Biol Chem 275: 36164–36171. Turgeon D, Chouinard S, Belanger P, Picard S, Labbe JF, Borgeat P, and Belanger A (2003) Glucuronidation of arachidonic and linoleic acid metabolites by human UDP-glucuronosyltransferases. J Lipid Res 44: 1182–1191. Uchaipichat V, Mackenzie PI, Guo XH, Gardner-Stephen D, Galetin A, Houston JB, Miners JO (2004) Human UDP-glucuronosyltransferases: isoform selectivity and kinetics of 4-methylumbelliferone and 1-naphthol glucuronidation, effects of organic solvents, and inhibition by diclofenac and probenecid. Drug Metab Dispos 32: 413–423. Wells PG, Mackenzie PI, Chowdhury JR, Guillemette C, Gregory PA, Ishii Y, Hansen AJ, Kessler FK, Kim PM, Chowdhury NR, et al. (2004) Glucuronidation and the UDP-glucuronosyltransferases in health and disease. Drug Metab Dispos 32: 281–290. Xu L, Krenitsky DM, Seacat AM, Butenhoff JL, Tephly TR, and Anders MW (2006) N-glucuronidation of perfluorooctanesulfonamide by human, rat, dog, and monkey liver microsomes and by expressed rat and human UDP-glucuronosyltransferases. Drug Metab Dispos 34: 1406–1410. Zenser TV, Lakshmi VM, Hsu FF, and Davis BB (2002) Metabolism of N-acetylbenzidine and initiation of bladder cancer. Mutat Res 506–507: 29–40. Zhang D, Zhao W, Roongta VA, Mitroka JG, Klunk LJ, and Zhu M (2004) Amide N-glucuronidation of MaxiPost catalyzed by UDP-glucuronosyltransferase 2B7 in humans. Drug Metab Dispos 32: 545–551.